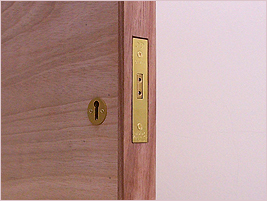 If you are fitting a mortice lock on a front door use a 5 lever lock with the BS(british standard mark) on. Most insurance companies will specify this level of security. With a pencil mark the position of the mortice lock and a centre line. 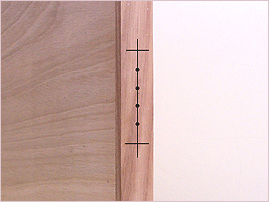 Along the centre line place marks for drilling out holes for the mortice body. 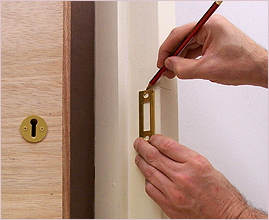 Some locks will come supplied with a paper template which makes things easier. With a flat bit just bigger than the mortice body drill holes deep enough for the lock. 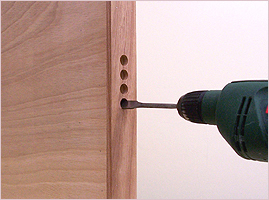 With a hammer and sharp chisel trim out the wood in between the holes to make one big hole for the mortise body to slide into. Place the lock into the hole and mark around the plate. With a hammer and sharp chisel cut a recess the thickness of the plate. Carefully measure the position of the key hole. (either with a paper template supplied with the lock or by holding the lock up against the door). 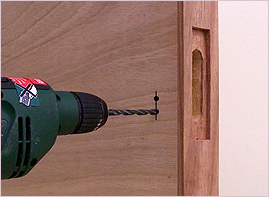 Drill out the hole then and tidy with a hammer and chisel. Make sure the key fits. Screw in the escutcheons(the keyhole covers) to both sides of the door. Mark the position of the strike plate. It is critical you get this precise or the mortice won't lock. Your lock may come supplied with a paper template to help with this. If not see my tip below for getting the exact position. Mark both around the outside the strike plate to recess it and also inside the strike plate for the lock to locate in. Chisel around your marked lines to the depth of the plate and remove enough wood so the plate lies flush with the frame. Chisel out a rebate for the lock to sit in. 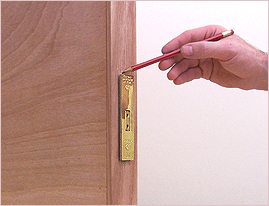 Tip to get the exact position for the strike plate mark the lock bolt with a wax crayon or something similar that will leave a mark, then close the door and try to turn the key so the bolt makes a mark on the door frame where it will locate when you've chiseled the recess. Line the strike plate up with this mark.